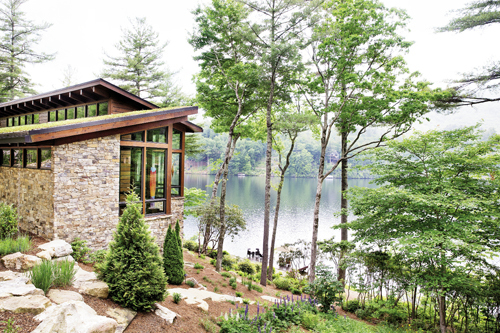 When the team from Platt Architecture in Brevard drew up the plans for Jeff and Elisha Zander’s home on Cardinal Lake in the small Lake Toxaway community, they must have thought of the photographer’s rule of thirds. A soaring pitched roof and multiple floor-to-ceiling windows frame jaw-dropping views of the lake, mountains, and sky, which are visible from every room in the house (all 7,000 square feet of it), save maybe the closets and a few bathrooms. The views are serenely transforming, and the house itself—contemporary by design—is a dream. The dwelling is also particularly impressive in how it’s almost cantilevered out over the water. Stand in the living room or on the deck, and it’s easy to forget the ground below. Talk about feeling at one with nature. This isn’t exactly a hulking house on a lake though. It’s large for sure, but given the steep slope and relatively short distance between the road and the water, the home gains its footage in height. Approach it from the pavement, and the dwelling looks like a modest single-story residence with the stone and Douglas fir exterior and attractive living roof blending nicely with the surroundings. Approach it from the water, which is not likely given that it’s a private lake, and the home’s grandeur is apparent. Inside, the house boasts five bedrooms and equally ample baths, a to-die-for office where Jeff carries out his work as head of an insurance company, a workout room and hot tub on the adjoining patio, a temperature-controlled wine cellar, an open kitchen, dining, living, and bar area that’s perfect for entertaining, and a deck upon which you might wish to live out the rest of your life. It’s replete with a sleek outdoor kitchen, fireplace, TV, and plenty of plush seating. And when the large glass pocket doors are tucked out of sight, the line between indoors and out disappears, allowing the scenery to come into the sharpest focus. It is the view, after all, that spurred the entire project. The Zanders, who hail from the hotter, humid clime of Nashville, Tennessee, began their love affair with Lake Toxaway 13 years ago when they brought their daughter, Halle, to Keystone Camp in Brevard. The couple checked into the Greystone Inn on Lake Toxaway. “We drove up in the middle of the night,” recalls Elisha. “I kept saying, ‘I can’t believe there’s a lake this high up.’” The view when they awoke the following morning left a lasting impression, one that lured them back again and again. They eventually purchased a small house on nearby Cardinal Lake, situated higher up the mountain from where their new home sits. “We were pretty sure that would be the extent of our investment here,” says Jeff. But when they found out that the property below was soon to be for sale, Jeff and a neighbor took a boat out to inspect the lot. “When I saw it from the lake, I knew we had to have it,” he recalls. The Zanders worked with Al and Parker Platt to design a contemporary dwelling that reflects the natural surroundings. With blueprints in place, they had gotten no further than building the driveway, a retaining wall, and a dock when the economy crashed. The entire project was put on hold indefinitely. But toward the close of 2009, Parker pressed Jeff to move ahead. Construction began in earnest in 2010 and was completed in 18 months. Unlike some who might take a more hands-off approach when hiring a team of architects and designers, the Zanders played a big role in the creation of their grand lake house. “Jeff and Elisha have a strong sense of their own style and aesthetic,” says Traci Kearns of Alchemy Design Studio in Asheville. She worked closely with the Zanders and Platt Architecture to design much of the interior. “They were very committed to the process and the creation of the project,” she says. Many aspects of the house are holdovers from their home in Nashville, including the shed roof and stacked stone exterior, as well as the contemporary style. And as with their Tennessee digs, rich reds, black, and brown colors and iridescent accents thread throughout the house. They also love exotic woods, using Lyptus for the flooring, ipe on the deck, bubinga for paneling in the foyer and the custom cabinetry in Jeff’s office, and sapele wood in the dining room, bar, and kitchen. The various colors and grains bring warmth and texture to these spaces. The granite fireplaces and countertops throughout were chosen with equal attention. “Jeff had more interest in granite than anyone I’ve ever worked with,” laughs Parker. One thing the Zanders didn’t know they wanted was a living roof. “Parker suggested the idea, and we were both excited about the thought of it,” recalls Jeff. With the house sitting below street level and close to the road, the roof is an extension of the landscaping. So unlike a lot of living roofs, you can actually see this one. Kate and Emilio Ancaya of Living Roofs Inc. in Asheville handled the construction, and at Jeff’s request, the plants all lean toward the red spectrum—a color, Parker points out, that speaks to Jeff’s passion for red wine, specifically California cabernets. The mix of sedums flower red and pink in the spring and summer, while the foliage fades to burgundy in the fall and winter.